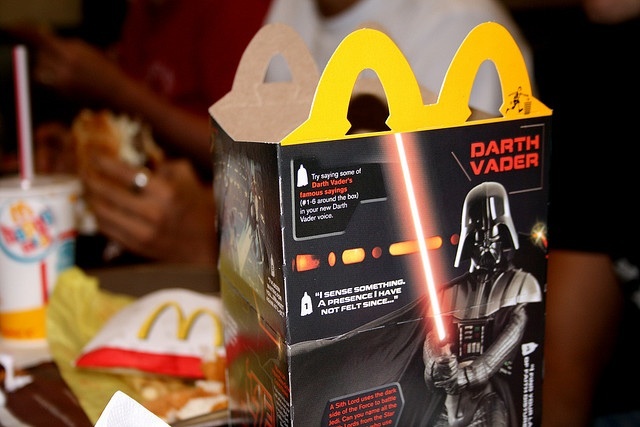 As a Star Wars fan, I'm digging this Happy Meal. Photo courtesy of jasonippolito via Flickr. I spent years collecting the toys from McDonald’s Happy Meals in a cardboard box. It was no coincidence that I was also a chubby child. Now, one city has taken action to curb the McDonald’s tradition of including toys in Happy Meals to market fast food to kids. San Francisco’s board of supervisors gave final approval this week to an ordinance that will ban fast-food restaurants from including toys with children’s meals that do not meet nutritional guidelines, which puts McDonald’s Happy Meals in the crosshairs, according to an article in the San Francisco Chronicle. The ordinance, which would go into effect in December of next year, prohibits toy giveaways in fast-food children’s meals that have more than 640 milligrams of sodium, 600 calories or 35 percent of their calories from fat. The law also would limit saturated fats and trans fats and require fruits or vegetables to be served with each meal with a toy. Health advocates are thrilled that this ordinance will help fight childhood obesity. Other folks, including San Francisco Mayor Gavin Newsom and McDonald’s franchise owners, object to the board regulating what children eat. My view? Bravo to the board for calling McDonald’s out for peddling junk to kids. I’ve seen parents (mine included) buckle under tantrums from their kids and buy burgers and fries for the family. But the city needs to lead some efforts to teach parents about healthy eating and ensure that families have access to affordable, healthy food. I work in an area where it’s easier to get a Happy Meal than an orange. Something has got to change on both ends to make this ordinance work. What do you think? Should a government group be allowed to regulate what a fast-food restaurant can offer kids? Take it to the comments. This might conceivably mean more if it weren’t San Francisco doing it. We’re talking about a city government that requires cell phone retailers to prominently display radiation information despite no concrete link between cell phone radiation and anything.